Carney Warns Rates May Rise in No-Deal Brexit Meltdown. The Bank of England governor joined the U.K. cabinet, chaired by Prime Minister Theresa May, to share worst-case economic scenarios used by the central bank, people familiar with the matter said. He told those present that crashing out of the European Union without an agreement would lead to a fall in the pound and higher tariffs, pushing inflation higher. That would make it harder to cut borrowing costs to support the economy as the BOE did in the aftermath of the Brexit vote in 2016, said the people, who who asked not to be named because the discussions were private. Carney outlined an extreme scenario in which house prices fall by 35 percent. The BOE has previously run stress tests showing that banks could cope with such a situation. Central bank policy makers, who cut rates to a record-low 0.25 percent in August 2016, have increased borrowing costs twice in the past year to keep inflation in check. Officials have previously said that Brexit could prompt a policy move in either direction. Chancellor Philip Hammond announced this week that Carney will stay on an extra seven months to ensure continuity during the transition out of the the EU after the U.K. formally exits in March 2019. 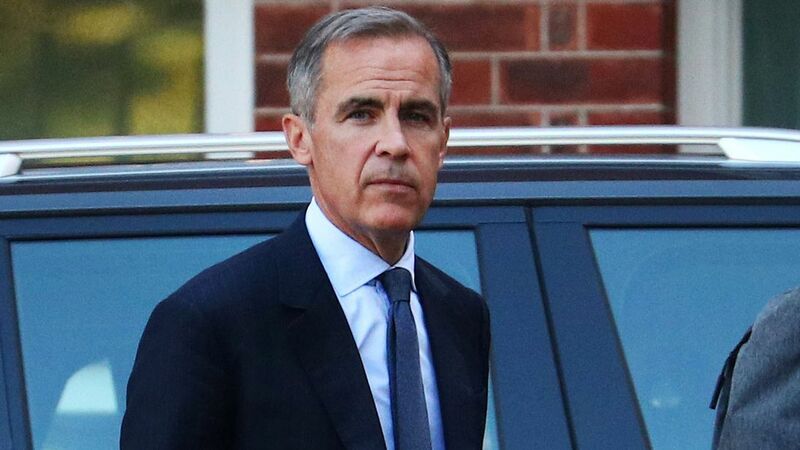 Carney’s high-impact appearance came as the BOE’s Monetary Policy Committee voted unanimously Thursday to hold interest rates unchanged at 0.75 percent after hiking at the last gathering in early August. They reiterated that Brexit was the biggest challenge to the outlook and that uncertainty about the U.K.’s future outside the EU had risen.